The pressure for Zuma to step down as president of South Africa is rising. It is a tide that does not seem to be going away. A group comprising ANC and SACP have announced plans for endless demonstration and workers strike from Monday. They say will happen, if Zuma fails to step down by Sunday night. President Jacob Zuma is going. He will go, and he must be gone, before the next election. The procedure for his departure is what is still unknown. Will he give the ANC a fight against the request that he should step down for the party to be able to unite toward the next presidential election? A statement credited to the first lady, Thobeka Madiba- Zuma, about tough times ahead in the country over demands for her husband to step down does not allow room for comfort, as a likely reflection of the thoughts among Zuma’s supporters What type of fight would Zuma put up against his party, when a new leader has emerged in the party to replace him? One news report said that there may be a plan by President Zuma to deny Cyril Ramaphosa the chance of becoming the next president of South Africa. 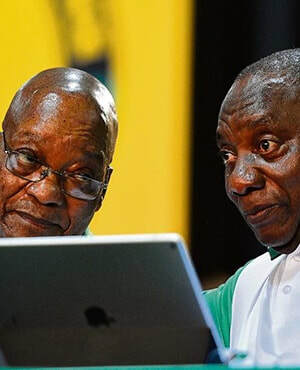 The plan, according to the report, said that Zuma has a plan to fire Ramaphosa as vice president, and to appoint his former wife, Nkosazana Dlamini Zuma, as vice president. But that report has been flawed as nearly impossible, because it could lead South Africa into political crisis, and one capable of hurting the ANC in the next election. Yet, the report seems to have confirmed rge first lady’s words about a likely political armageddon to be witnessed in South Africa over Zuma’s refusal to vacate office. The question this leads to is why Zuma will want to take his country into avoidable political circus, when he could help resolve a political impasse and ensures the ANC is intact, to be able to fight and clinch victory in the next election. Is he so mean to want to make the black population look disunited, because he wants to cover up his alleged corrupt past? However, there is another report about talks that have reportedly advanced in the ANC toward recalling Zuma from office as president. A meeting that was schedule towards his recall was said to have been cancelled at the instance of Ramaphosa, because according to reliable sources, Zuma had given Ramaphosa an assurance during an earlier meeting, that he would relinquish power to Ramaphosa, without unnecessary drama. But one report said that Zuma refused to relinquish power, amid assurances from Ramaphosa that there would be amicable resolution to the power impasse, and he that he had not promised to shield Zuma from investigations into his alleged corruption in government. Zuma is said to have demanded protection for himself and family and payment for legal services by the people in cases against him as part of conditions for him to step down as president. His demand has made the treasurer for the ANC angry and told members of a church last Sunday that Zuma will go and the the process for his removal has begun.